We recently had a chance to review the latest studio subwoofer from Home audio giant Yamaha. The 8 inch bass-reflex powered Yamaha HS8S Studio subwoofer has got impressive specification on paper and also has got many positive reviews from its users. All Yamaha products are made using the high quality materials and the most advanced manufacturing techniques. Does this model manage to deliver the same premium experience as its preceding models from the company? It is the best subwoofer you can buy in terms of value for money? We find out in our Yamaha HS8 review. 22Hz – 150Hz frequency response with High-power 150W amplifier exclusively designed for low frequencies. The LOW CUT switch, LOW CUT controls and HIGH CUT controls to enables attenuation of frequencies. High end enclosure design to reduce resonance level. XLR and TRS phone jack inputs and XLR outputs for L and R.
If you’re looking for your first subwoofer, look no further than the Yamaha HS8. 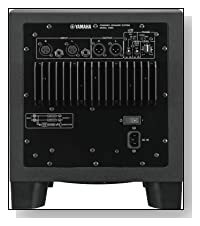 The latest subwoofer model from Yamaha has high end enclosure design to reduce resonance level and deep pounding bass. This model has frequency response of 22Hz – 150Hz to relieve your main speakers from performing bass duty. Your main speakers having only to reproduce the mid and high frequencies, alongside this subwoofer providing powerful bass, will take your home cinema experience to a higher level of enjoyment. It took few minutes playing with Volume button to get the right balance between the sound level of the subwoofer and our tower speakers. We played wide range of songs across variety of genres to test clarity in detail and quality of bass. You would definitely notice that the subwoofer is specially built for home theater, it will allow you to hear movie special effects like war firing, thunders, animal roaring, explosions, racing car sounds etc. with super high fidelity. The model comes with High-power 150W amplifier, low cut and high cut (80-120Hz) controls for attenuation of frequencies to enhance audio experience. The second remarkable thing about the Yamaha HS8 is its built-quality. The plastic used for this model feels durable and strong. Having said that, Yamaha could have innovated a little more when it comes to design. 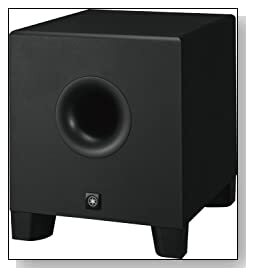 The subwoofer design appears similar to other budget rectangular boxes available in the market. The design sports four short legs which provides good vibration damping and stability at higher volumes. We must point out that, the model is not exceptionally attractive but looks comparable with other models. Overall, the model is best for someone who choose performance over style. This model really stands out in terms of sound quality by offering powerful and clear bass. The Yamaha HS8 subwoofer somehow has that WOW factor in providing incredible special effect sounds, surely will enhance your movie watching experience. This model is priced marginally high by the company but we feel Yamaha HS8 is obviously a better choice than its peers out there in the market. If the price tag doesn’t deter you, this subwoofer won’t be a bad decision to redefine your home theater experience.